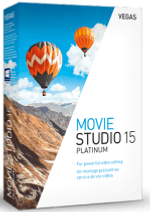 VEGAS Movie Studio Platinum is designed for fast editing and enhancedcreativity, it empowers your creative process with versatile editing tools anda powerful feature set. Work in Standard Definition, High Definition, or stepup to 4K and your video effects, composites, and text elements will shine withprecision. Customise, arrange, and save workspace layouts to match the task at hand andimprove efficiency. The new Quick Start dashboard makes it easy to get startedand work productively.